Night game drives offer the opportunity to explore a range of nocturnal wildlife that is generally unseen during the daylight hours. Under the powerful beam of a red-filtered UV light even the most frequently seen animal can take on an entirely new shape or appearance. The thrill of catching the glinting white reflection of a predator’s eye in the torchlight will certainly send shivers up the back of your neck. Even on the rare occasion when the wildlife seems to elude you, there are still the sounds of the night to absorb when the vehicle shuts off and allows the darkness to enfold you. 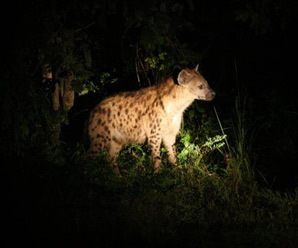 It is the experience of being in the wild at night that makes night game drives so exciting, and it’s an experience which cannot be attained inside the confines of the Masai Mara National Reserve.